Click BELOW for Real Time Analysis Blog on Controversial NGO + MIT Allegations #trackingewaste. - Research leads, links to vetted data. Unlike normal blogs, this one is being updated with information about the "scandal" of alleged e-waste exports to Hong Kong and other countries, made to support NGO's claim that it's paid e-Stewards certification, or national legislation, would cure environmental problems overseas without resulting in collateral damage (impugning reuse and refurbishment operations, boycotting geeks of color, sacrificing tradeable commodities covered under WTO "cores" law, racial profiling of recycling operations, false attribution of Basel Convention standards Annex IX B1110, fallacy in sampling data, sampling bias, etc.). The chief counterpoints to this blog (the story we are debating) can be found at the links below. Like every one of these blogs, the views here are only my own and do not represent my company, any research or journalists I cooperate with, or the not-for-profit Fair Trade Recycling group (WR3A). The views are put forth in belief in debate, rebuttal, and defense of a trade which has received exaggerated and hyperbolized accusations, often against Emerging Market Tech Sector businesses who have little ability to respond to "profiles" created in the Western Press. 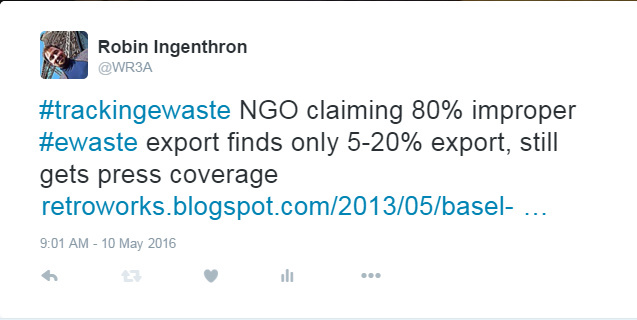 For ten years the Blog has told everyone that the NGO was making up the "80% Export" e-scrap myth out of whole cloth, and knew it was misleading reputable journalists in an "e-waste hoax" campaign that benefited the NGO financially. For ten years we have documented that the NGO uses photos of poor people, implying it benefits them, but never spending a single penny to assist or aid them in any way. For ten years this blog has alerted Interpol, EPA, trade associations, university researchers, interns, legislators and journalists of misleading and incomplete information being generated about the import and export of second-hand and secondary market commodities. I do not know how long I will update this piece on the NGO's accusations against Goodwill Industries and certified and non-certified electronics recycling companies, and the overseas markets they may or may not trade with. My passion for this is driven by victims in developing and emerging markets who are a) recycling material their own country traded in to them in upgrade, b) refurbishing newer second hand equipment imported from the USA and other "rich" nations, and c) general disgust as an environmentalist that organizations seeking to benefit from "strategic metals retention" or "planned obsolescence" or "protecting shredding investments" may be funding a propaganda campaign against the people I called (over ten years ago) "Geeks of Color". I've been working all day on my own company's exposure to this witch hunt. Why did MIT lend it's credibility to a serial emerging-market killer? Right now that sounds and feels brilliant, but right now it's 1:30+ in the morning. And Ive been writing letters of defense all day. I'm saying if you want to look at one printer, heck I'll show you 4,000 tons of printers we processed over 5 years. No one is hiding anything. YOU guys put a hidden tracking device on MY property, and you owe ME a phone call. Ok maybe we will return to this format, as insights and info are still arriving in "real time", but some important blog-worthy ideas are also ripe to write an entire column about. Have to weigh how this is diverting me from work and from bigger picture writing. New info - information that BAN may have released more than 200 GPS devices, and the methodology with which BAN selected those devices. It is critical that reporters ask this question of BAN and MIT, and it's important that BAN knows that we know at least some of the answers already. Going to a recycler with a zero-reuse policy and no testing staff, and letting them tell you something is junk, is much more "efficient" than opening the devices and rendering them "unrepairable". If it's true that some devices were released on the "assumption" that they were "waste", that has to be disclosed by MIT and the NGO. I'm telling you, I believe the source who told me that happened on some devices, but the problem with exposing it is that we don't know if those are in this 200 object tracking sample. MIT could get in a lot of trouble if it lets its research department be led by an NGO with a clear bias and agenda. It's possible this is a good thing for the research, if for example BAN used the non-sabotaged material and a professional researcher made a decision not to include data based on sample selection error. But if the first sample brought back info BAN didn't like - e.g. it was done when metal prices were high, reuse markets were low, and they identified a very small export tracking example - withholding that data is a major problem. These questions could be cleared up if BAN releases data on the majority of the 200 items that were not exported. Perhaps they are sitting on a floor somewhere, unprocessed, in storage, and BAN is hoping to find out if they will eventually be dumped or exported. But maybe the device was repaired and is in use Or, if the device was hand-disassembled, the GPS tracker itself may be with parts on a rack and still transmitting. Another issue coming out is applying other mature waste management systems data to e-waste/scrap. Sewage treatment plants, for example, are designed to manage a city or county's peak rainwater and sewer generation, but they are not designed for every conceivable event (See "Flushed Away" animated movie climactic "halftime of soccer match" scene). A convention, stormwater, a lot of things cause sewer systems to be overwhelmed and crap comes out on the street, and it's a judgement call for regulators whether it's a prosecutable event (deliberate release of poo to save money) or a design flaw (system wasn't built to handle Convention) or act of God (Hurricane Sandy). Our industry hasn't been as well studied, but as an insider I can tell you that spikes and crashes in demand for reuse, spikes and crashes in demand for metals or plastics, Earth Day events, Superbowl and Christmas TV purchase decisions at Best Buy, etc., can impact storage and shipment decisions. Storing and speculative accumulation decisions are different for recyclers in winter months, when you are trying to keep full payroll rather than seasonal lay-offs, than they are before Earth Day events. The timing at which BAN sent a "bad track" device to an individual recycler may be as important as the device they sent. 4:56PM From National Geographic 2008, article proudly featured on NGO web page"
"Many governments, conscious that electronic waste wrongly handled damages the environment and human health, have tried to weave an international regulatory net. The 1989 Basel Convention, a 170-nation accord, requires that developed nations notify developing nations of incoming hazardous waste shipments. Environmental groups and many undeveloped nations called the terms too weak, and in 1995 protests led to an amendment known as the Basel Ban, which forbids hazardous waste shipments to poor countries. Though the ban has yet to take effect, the European Union has written the requirements into its laws." Basel Ban Amendment isn't passed still. It stalled when, in 2011, Sec Basel Convention did studies in West Africa and found that the statistics issued by NGO were phony, It was not "80% dumping" or even close to "over half". How does an organization get away with repeating, over and over, that international law is violated when it hasn't? How long will reporters fall for that story that the USA is the only one not to ratify a convention (true) when the convention doesn't say what the NGO claims it says about recycling exports? 12:23 PM Another fallacy strikes me...! BAN takes a laser printer with a known high likelihood of reuse, something purchased by Egypt's amazingly good Tech Sector. They get it, and while they repair 80% of the printers they import (as they must, to pay for that shipping), the NGO has sabotaged this one. So they sell it for scrap metal, and it now goes to Hong Kong. The fact that BAN is sabotaging the devices, if they did make them non-repairable, would skew the samples to go to scrap yards rather than repair. NONE of the sabotaged devices would wind up in a place @PBS cameras would be amazed and proud to see. They avoid capturing photos of the Geeks of color when they render something scrap and then only follow its last destination. Important second note: E-Tech responded to the Canadian attack by getting its Hong Kong offices certified to R2 (e-Stewards competitor certification). 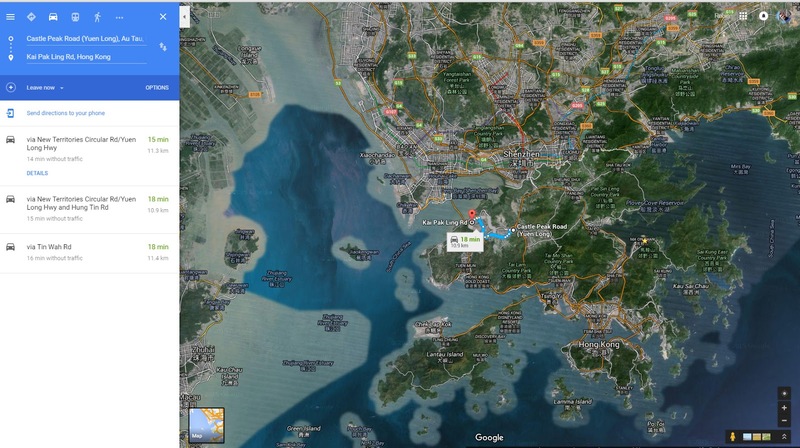 It's amidst 16 R2 Certified companies in Hong Kong-Shenzhen area! Drill Down And the 2 closest ones to that printer is ... Wing Kai Destruction, and ...E-Tech Management (see NGOs 2013 attack on E-Tech below). Charity chooses less expensive option (keeping more for public services), the Asian export company. Big Shred Co. forms certification NGO (BS NGO) to enhance its image, distinction with Asian competitor. NGO goes after Asian company with hidden cameras in Vancouver. Asian Company rushes to certify its operations with competing certification NGO, to lower certified distinction. BS NGO plants pieces likely to be exported (sample error) at the Charity locations, tracking their devices to Hong Kong. See the math below. BS NGO has basically recreated the same amount of export as all the previous studies we've been siting, 20-30% exported if you include reuse, 5%-15% range if you don't. And per the theme of this blog - it's the photojournalism, not the datajournalism, that's playing. Shredding Company A has trouble competing with Charity B who sells SOME material to Asian Recycler C. Is the reason they have trouble competing the "primitive Asian recycling", or is it shredding having trouble competing with value added of reuse? You can't know by knowing the geographic location (Hong Kong) whether the imbalance is from parts reuse or low standards - but Hong Kong has high wages ($15k per MONTH!) and pretty strong laws... it's the proximity to Shenzhen, where parts can be "repurposed", that drives the trade. I will give you all a chance to follow these links. ERA is Goodwill, the companies accusing ERA are the ones funding the NGO. Follow the math. Dell does not cover TVs, VCRs, air conditioners, etc... only about 30% of the e-waste they could be accepting. But those are the only items BAN.org tagged, tracked or wrote about. Of those, only 7 out of 46 were exported. 15.2% of 30% demonstrates 4.6% export. Yet PBS announces this as "most" or "many" are not recycled. "In this first report we specifically focus on the fact that even highly reputable companies, such as Dell, Inc. and Goodwill Industries International, also are acting either dishonestly or carelessly. They have been revealed to be part of the unsustainable chain of disposal involving export to developing countries. By violating even their own stated policies, these corporations have created a deadly disconnect between stated intent and reality. This disconnect violates the trust of consumers and customers while seriously damaging human health and the environment. • 13% of the tracker-enabled equipment dropped off at Goodwill stores resulted in export from the US – a trade that was likely illegal. 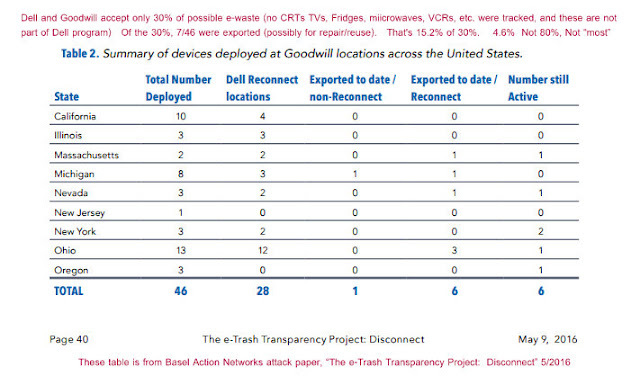 • 18% of the tracker-enabled equipment dropped off at Dell Reconnect Goodwill Partner stores resulted in export from the US – a trade that was likely illegal." See Part II, Baseline Data Bingo. BAN GPS tags devices they tell us are 80% exported. They find 13% exported by Goodwill, which manages only office equipment most likely in demand by the export market. They have only demonstrated 4.6% likely export (if you assume that the big heavy items not visible in any BAN photos were not exported, which syncs with USA CRT glass pile data). But they are just assassinating the character of a fellow Non-Profit organization and its corporate sponsor. 11:03PM Signing Back In... now that I'm reading this BAN Report more slowly, I realize they probably just proved that export is UNDER 10%. They are saying 65 overseas devices out of 200 is "about a third of all devices". But the ones that went over to Hong Kong were 12 pound LCDs or 8 pound inkjet printers. BAN put NO GeoTags on CRT or projection screen TVs, or even large LCD TVs, or copy machines etc. The "one third" is all light stuff, and they know perfectly well if they had tagged the heavy things I just mentioned, none of that would go overseas... that's probably why they didn't tag them. And that heavy stuff (CRT TVs, projection TVs, plasma TVs, copiers) is about 65% of the weight. So they calculate 1/3 of the items which are 1/3 of the e-waste... that's 10%. See the screenshot. 200 items tagged. 37 CRT monitors (15"), 26 LCD monitors, 21 printers. I can show as a percentage of the "e-waste" stream that those items add up to around 20% of the weight if you include copiers. If you use the EU WEEE definition (adding fridges, microwaves, air conditioners, etc) you would be even smaller. 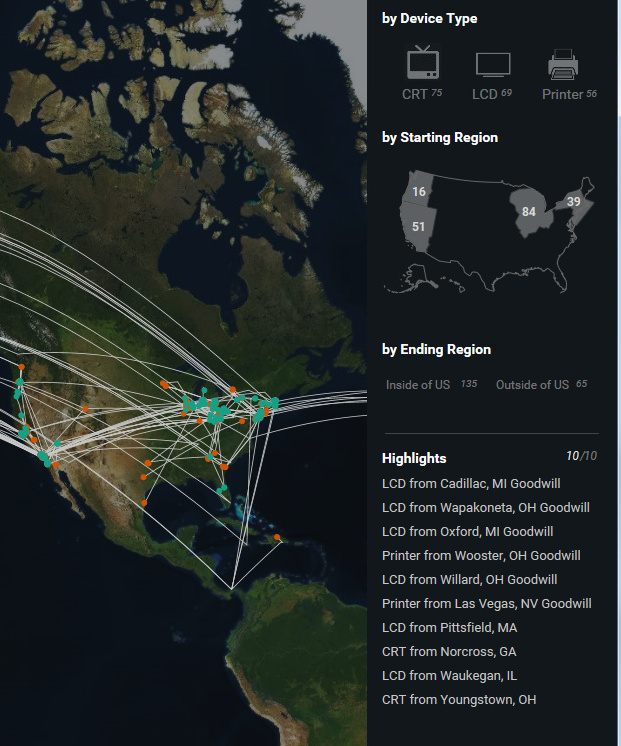 In the Chicago area, 84 devices were tagged, 62 stayed in the USA, 22 were exported. Of the exported, 3/18 printers were exported, 13/26 LCDs, and only 6/31 CRTs. In the Northeast area, 4/13 CRTs were exported, 4/13 LCDs exported, and 7/13 printers. In the Southwest/CA, 2/13 CRTs exported (does that include Mexico? ), 9/19 LCDs, and 7/17 printers. In Northwest, 1/5 CRTs, 3/7 LCDs, and 0 printers were exported. That totals 65 devices outside the USA (including Mexico where TDM is) out of 200 or 32.5% OF THE LIGHT STUFF, and most likely to be exported stuff. Some copy machines, air conditioners, etc. probably get exported (for reuse mostly) but almost no CRT or projection TVs. BAN is probably happy with the way PBS made this sound. But they have basically come pretty close to the 20% exporting estimate we have said all along, basically confirming it. The question is, of the 20%, how much of that is recycled just fine, or reused even better than USA? 9PM signing out after trying to read more of the Dell report. File under "no good deed goes unpunished"... Dell manages to domestically process 70-80% of the material, helps out a charity which is otherwise deluged in the stuff, and the NGO isn't going after Lenovo or IBM or Acer or anyone who did nothing. Only going after the company that actually did something. 6:46 BAN Report criticizes Dell for not doing more to lobby for legislation. That's nuts. 6:42 BAN report acknowledges that Goodwill has right to sell locally for reuse, before computer gets sent to Dell's recycling vendor. I know people from Africa and Pakistan who buy from Goodwill and Salvation Army stores and ship back to their homes for repair and reuse. 6:36 PM Report implies that Dell and Goodwill violate international law. Categorically false. “The Goodwill Member Task Force on Electronic Recycling recognized the importance of business standards in building alliances with other organizations. Therefore, it adopted a Goodwill-wide set of policies based on the Basel Protocol (ratified by 169 countries) that bans export of electronic waste to developing countries.” However just prior to publishing this report BAN contacted Ms. Susanne Fredericks, the Sustainability Specialist for Goodwill Page 22 The e-Trash Transparency Project: Disconnect May 9, 2016 Industries International, and asked her if such a policy currently existed. She replied: “Goodwill organizations are reminded to work with electronics recyclers who have an industry accredited certification such as e-Stewards or R2.” When pressed a second time for an answer as to whether a policy existed she replied: “For the Goodwill organizations that do not participate with Dell we encourage the use of certified recyclers and to further ensure that compliance around the proper handling of electronics is adhered to, a toolkit containing processes, protocols and audit and certification options is in development.” It is concerning that by this correspondence it appears that Goodwill does not have their own policy against export of hazardous e-waste to developing countries, but rather leaves that responsibility to their certified downstream recyclers. The Basel Convention explicitly allows export for recycling and repair, so long as no hazardous waste winds up on the ground disposed. See Annex IX, B1110. Basel Action Network is extemely well aware of this, as they promote Basel Ban Amendment to change it. This paragraph acts as if the Amendment has been passed and ratified, which is nonsense and PBS should take note of this kind of thing. 6:14 PM Reading BAN's report. I'm going to post some of these observations in "breaking" format as I notice them, and update this page frequently. "Of the 28 Goodwill stores that were part of the Dell Reconnect public e-waste takeback program, 6 of these were exported reflecting an export rate of 21%"
We therefore delivered 46 of the total project’s 200 tracker-enabled electronic devices to Goodwill stores around the US— 28 of them at Goodwill stores that are collectors for Dell’s Reconnect program and 18 of them at Goodwill stores not associated with the Reconnect program. Of the tracker-enabled devices deployed at the 46 different Goodwill stores, 7 of these (15% based on our sample) were exported to Asian countries: 4 to Hong Kong (1 printer and 3 LCD monitors), 1 to Mainland China (1 printer), 1 to Taiwan (1 LCD monitor), and 1 to Thailand (1 LCD monitor), as of the publish date of this report. All of these exports were likely to be illegal (see Export and The Law). Of the 18 non-Dell Reconnect stores, only one was recorded as being exported. 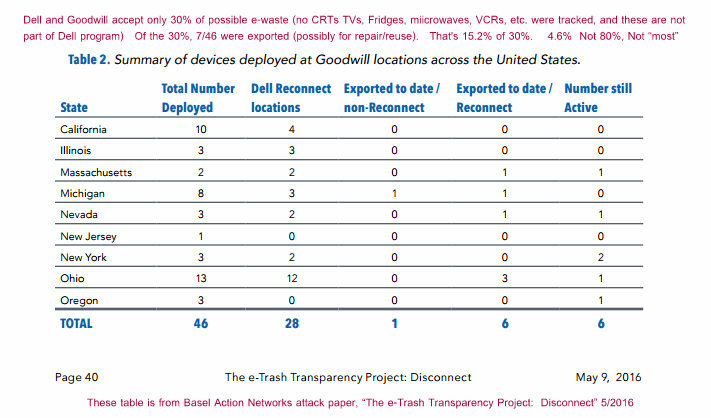 Of the 28 Goodwill stores that were part of the Dell Reconnect public e-waste takeback program, 6 of these were exported reflecting an export rate of 21% of all trackers delivered to Dell’s Reconnect Goodwills. If you only accept 30% of e-waste categories, you are more likely to export. But you are also most likely accepting the most useful stuff, especially if you are a thrift organization like Goodwill! BASELINE DATA FALLACY BINGO. BAN has been working on this for a couple of years... why didn't they stop and realize that Dell Reconnect is for COMPUTERS ONLY. If most of the Goodwills in the Dell Reconnect program don't accept large TVs that no one wants for export, then as a percentage of equipment, they will have many more that can be reused! And unlike Total Reclaim, which signed BAN's "no export for repair" pledge, Goodwill has not (though Dell may have). This is Data Fallacy Bingo... If an end point receives no absolute heavy CRT TV junk, then they are more likely to export a higher percentage. And the 21% BAN cites is hardly a high percentage of computers to a reuse program. The more selective you are - say you only accept Windows 7 and higher laptops - the more likely the item is to be exported for repair. Hardly grounds for this reckless attack on Goodwill and Michael Dell.